Android has a built in email client application that you can use as your email client. If you have an email account on Google Apps, you can configure this email client to access your email apps account. NB: The screenshots below using Android 2.1 (Eclair) running on Samsung Galaxy Spica. Email client will download your messages, you can configure more options by pressing the menu button. Nice article, very much simplified the process! We couldnt get the setup for Google Apps right then we had got in touch with a company called searce apps..i think their site is http://www.searceapps.com they did it for us. They charged us but the charges were very nominal so that was ok. besides services were good and prompt. i recommend your article to my friends, its really very helpful to new users! 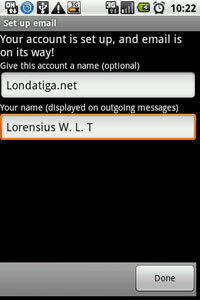 hi lorenz, where will be the gmail message data will be stored? is it on the SD card or on the internal memory? because my gmail is currently around 1GB.hehe. you really have a nice blog! Gmail data are stored in Gmail server, not on internal or sdcard. Nice guide to Setup Google Apps Email Client. Thanks. I have had my set up like this for awhile but the outgoing email address for people o reply to is wrong. Anyone else run into this? What’s the fix? 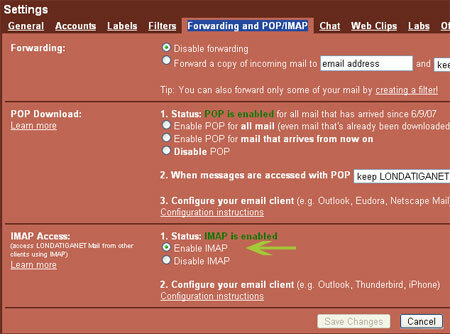 I have enabled IMAP from the settings tab as well but still it doesnt work. P.S – Trying to configure on my new Samsung Champ phone. Thanks for the detailed description. It seems like it is straightforward, but my phone (samsung fascinate) never progresses beyond “checking incoming server settings”. 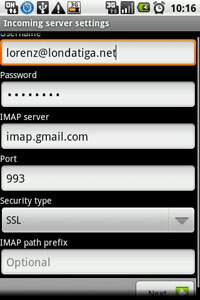 I have also checked to make sure IMAP is enabled in my google apps mail account. Very good & clearly defined steps. Thanks allot for your efforts. Is there a way to configure a signature? Thank you!! Have been trying to figure out since last 5 days. You are awesome. Thank you so much… Verizon had me do an unneeded factory reset and I was bummed after I lost all my ‘hard work’ setting up things like this. Thanks for taking the time to a write a great tutorial. Good Karma coming your way!